19° Cloudy with isolated showers. FULL TIMENorth Melbourne have come to Sydney and they have conquered. They adapted to the conditions best and were led by Scott Thompson to record a memorable 43 point win. GOAL SWANSO'Keefe is left alone and takes a mark in the pocket. From 35 metres out near the boundary he guides it through. The Swans will take this on the chin and look to regroup next week, but it doesn't come much tougher than against Fremantle. 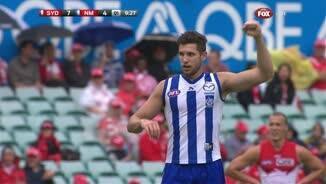 GOAL KANGAROOSNorth Melbourne get it back from the kick out and Wells prances and dances into an open goal. He can have a cup of coffee but elects to kick the goal first. BEHIND KANGAROOSMcDonald tries one from 50. He begins to celebrate his first career goal, but then it hits the post! GOAL KANGAROOSGoldstein is infringed upon in the ruck and he is paid the free kick. From 30 metres out Goldstein joins in the chorus and kicks the goal! North Melbourne are doubling their score! North Melbourne have been outstanding in the second half and the much hyped expectations of their fortunes in 2014 may in fact be on the ball. Nick Dal Santo has had another good day at the office for North Melbourne. Nobody in the North Melbourne camp will be complaining about that acquisition. GOAL KANGAROOSShaw marks in defence and plays on before Wells wraps him up like a baby in a blanket and that's holding the ball! 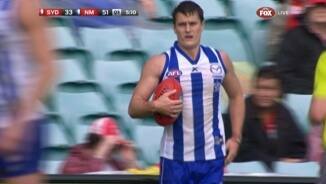 Wells converts and the Kangas are mighty this afternoon! 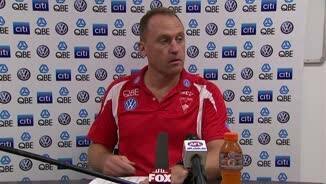 Swans coach John Longmire is working the phone at the moment and one would suspect he isn't on the phone to Mrs Longmire telling her he will be home from work early. BEHIND SWANSAnother rushed behind to North Melbourne. 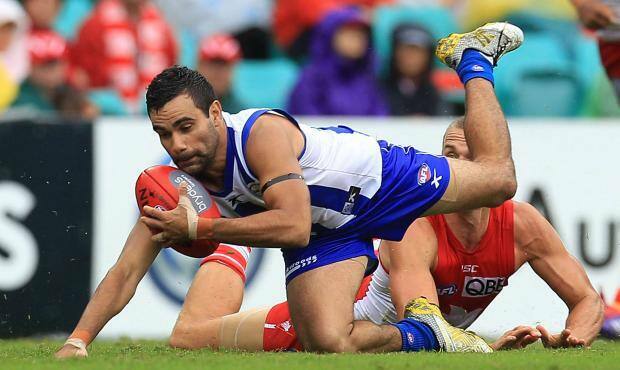 BEHIND KANGAROOSA rushed behind conceded by the under fire Swans. Cunnington is enjoying a break out season for North Melbourne and has been amongst the best in all of North Melbourne's wins this season. 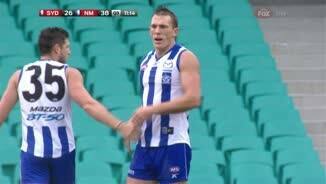 Scott Thompson has been outstanding for North Melbourne this afternoon. If he is not the best defender in the competition he is not far from it. Franklin has been ineffective. BEHIND SWANSA great defensive punch by McDonald who gets himself between forward and ball to prevent a near certain goal for the Swans. GOAL KANGAROOSSome great body work by Atley paves the way for Adams to take the ball and kick it along the ground for a goal. North Melbourne are just about home and hosed. Franklin has been reported for an incident behind play on Thompson. Doesn't look to be much in it. BEHIND SWANSRohan is infringed upon by Atley but his kick from 50 misses to the left. GOAL KANGAROOSMcKenzie with a terrible kick inside 50 but Parker drops it. Mullett pounces and snaps it through for a goal. A very lucky goal for North Melbourne. GOAL SWANSMcVeigh marks over the top of Harvey 40 metres out. He walks in and kicks a very important goal for the Swans. BEHIND SWANSRichards runs inside 50 but his kick bounces to the right of the target. Franklin needs a big quarter for the Swans to get back into this. 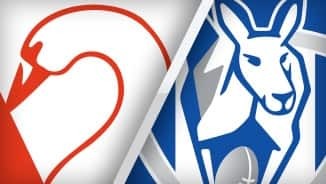 GOAL KANGAROOSNorth Melbourne run in a pack towards 50. They are quick, they are mean and they are too good for the Swans. Thomas runs in and burns the grass with a rolling goal. SUBSTITUTIONNorth Melbourne have activated their substitution with Ben Jacobs coming on for Robin Nahas. THREE QUARTER TIMENorth Melbourne continue to edge ahead and are one quarter away from possibly recording a rare victory in the harbour city. Mitchell with the set shot at goal 53 metres out but his kick doesn't register a score. Sydney don't have any run at the moment. BEHIND KANGAROOSCunnington has it on 50 but his shot is lucky to sneak in for a behind. With just under 4 minutes remaining in the third quarter a North Melbourne goal would really make things difficult for the Swans. North Melbourne edging ahead in the clearances in the third quarter. SUBSTITUTIONSydney activated their substitution earlier this quarter with Derickx surrendering to the conditions and Gary Rohan coming on across half forward. BEHIND KANGAROOSThomas runs inside 50 and a superb chase by Smith puts him off his kick. 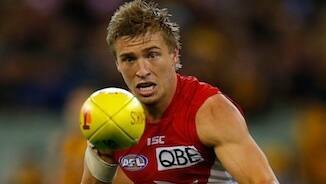 O'Keefe has not had a huge influence on the game today and the Swans need him to stand up. Welcome to SCG for the Sydney Swans v North Melbourne Round 4 clash. 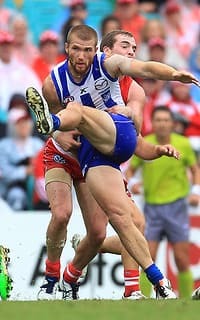 NORTH Melbourne has officially stamped itself as a team on the rise and left the Sydney Swans in significant early-season trouble following a 43-point victory at the SCG. After a slow start to the year, the Kangaroos knocked off previously undefeated Port Adelaide last week and have now ended a long winless run against the Swans, prevailing 13.13 (91) to 6.12 (48). It is North's first win over the harbour city club in nine attempts, dating back to round six, 2007, and first triumph at the SCG since 2004. 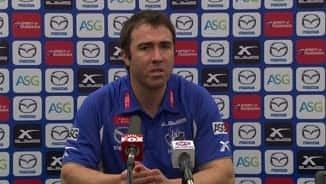 "I thought it was a pretty complete performance against an opposition that we clearly have enormous respect for, for obvious reasons," North coach Brad Scott said afterwards. "They have been really good side over a long period of time, but specifically when it comes to us, they have taken great joy in beating us over a long period of time. "Even well before my time, Sydney have had the wood over us, so it is a pretty important win away from home." It is a very different story for the home side, however, which started the year right among the premiership favourites, but finds itself stuck near the foot of the ladder with a 1-3 record. The last time the Swans started 1-3 was 2006, a year when they finished the season in the Grand Final, but those heights seem a long way away, with a clash against Fremantle at the SCG up next. "Some of the basics of the game, particularly in the conditions – we over handballed too much too early and went the other way when it dried up," Swans coach John Longmire said. "Things like leaving the ball over the back, just a basic part of the game in the conditions like they were today that we didn't get right and paid the price for. "Also we didn't use the ball to the level we know we can and should, but that all gets back to that general pressure and hardness. "It's amazing how well we use the ball when we get that up to the level we need it." The Roos had winners all over the ground, with Ben Cunnington, Nick Dal Santo and Leigh Adams leading the way, while Aaron Black and Daniel Wells kicked three goals and Aaron Mullett added two. Scott Thompson also continued the sort of form that led to his All Australian selection last year, keeping Lance Franklin to just 13 touches and one behind in his SCG debut as a Swan. Franklin was reported in the last quarter for striking Thompson, although most felt there was very little in it. Josh Kennedy relished the wet conditions and had help from Swans co-captain Jarrad McVeigh, with defender Jeremy Laidler their only multiple goalkicker with two. But the story is the Kangaroos, who sit outside the top four on percentage alone and will have plenty of confidence heading into next week's MCG clash with Collingwood. The game started in heavy rain, with Kieren Jack opening the scoring with a sweet set shot in the second minute before North kicked into gear. Able to cut off most of the Swans' forward entries, the Roos were working their way down the other end of the ground using the wings, with Black and Sam Gibson particularly busy. Two late goals gave North a nine-point quarter-time lead and another Black major to start the second gave it a handy edge in the conditions. The home side then got its motor running, producing the game's next five scoring shots, but only Laidler's superb effort from a tight angle was a goal. At the end of an intense first half the game was perfectly set up, the visitors leading by one straight kick. The arm-wrestle continued into the third term, but goals to Wells, Drew Petrie and Black – with a rare Heath Grundy goal the Swans' only reply – gave the Roos what looked a commanding 19-point lead at the last change. And so it proved, with North slamming through six goals to two in the final quarter for a commanding victory that will give their supporters plenty of hope for the year ahead.